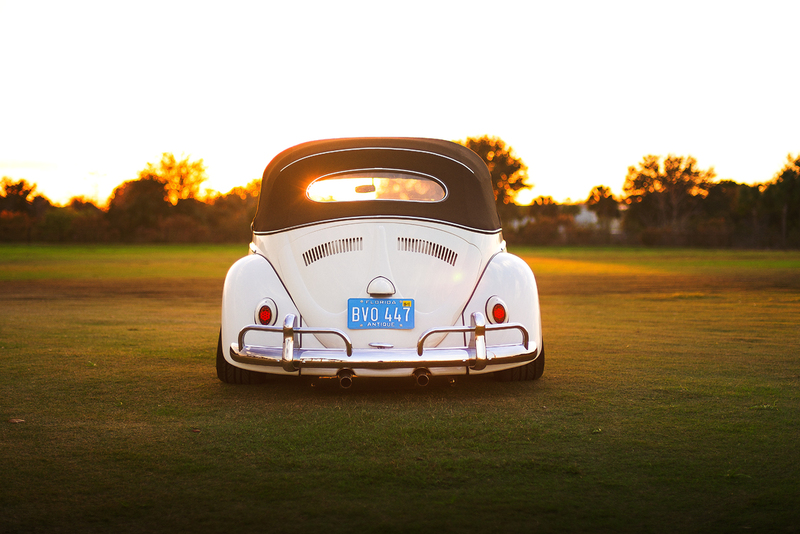 The Volkswagen Beetle is an iconic and cult classic automobile. 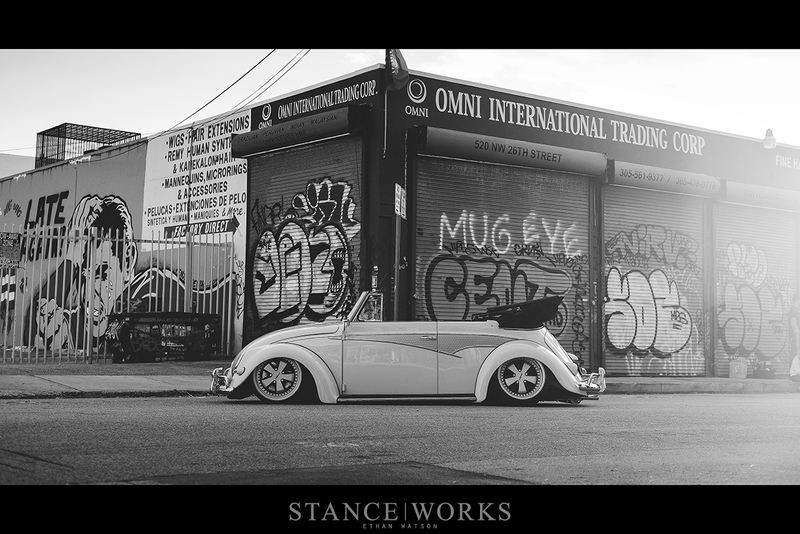 Its timeless design has been built and modified in a multitude of ways, but somehow there are still those that manage to separate from the status quo. One of those people is Mike Unland. 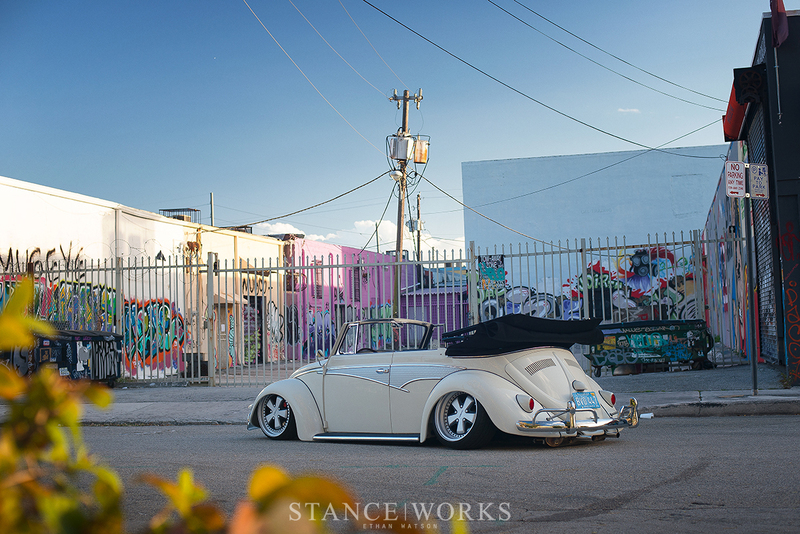 Mike's 1959 Karmann Kabriolett was built with a philosophy of fusing old school with new, aiming to create a nice blend of styles while maintaining the foundation that made these cars so special. His changes are extensive, with some standing above others in terms of the obvious and the prevalent. Other tidbits are bit less discernible, with a bit of backstory proving to enrich the build at hand. Mike's aesthetic changes began with the exterior of the car. Clad in Aussie Flash Trim, perhaps the most notable change is the custom matte black and silver designs that fill the space. Originally blue and black, the zig-zagging lines are inspired by Vintage VW part boxes, a nod to his hybrid old-and-new theme. 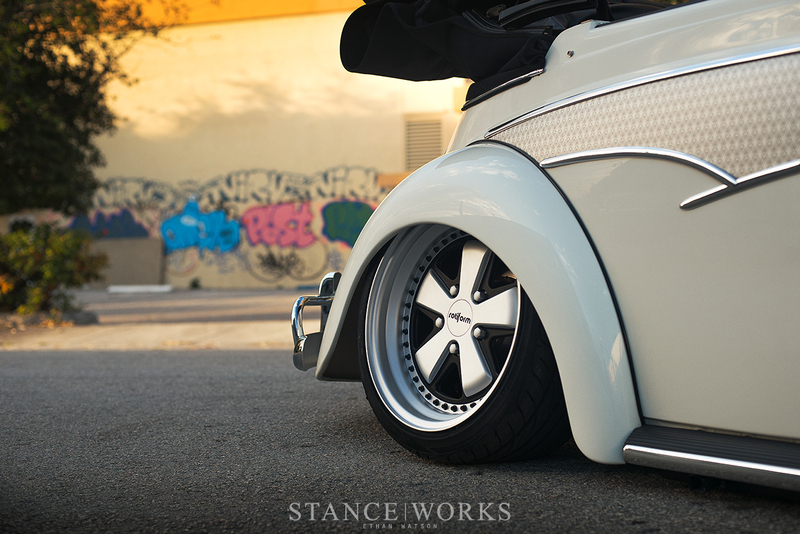 Furthering his idea is the use of one of Rotiform’s more recent wheel designs, the FUC. Inspired from the classic Porsche Fuchs, these custom 3 piece wheels are finished in a matte aluminum with ceramic black detailing along with matte black hardware, giving a nice old school look with a new school finish. Behind the FUCs in the front sit an adapted brake system from a Porsche Boxster, which utilizes the Porsche/Brembo calipers and cross-drilled rotors on 944 hubs. The rear brake setup consists of Bad Brakes from Airkewld in Arizona, built with a billet center hub with a bolt on rotor disk and their rear caliper setup. The rear rotors were highly modified which allows the FUC to have a larger rear lip in the rear, all while still tucking into the rear fender when aired out. 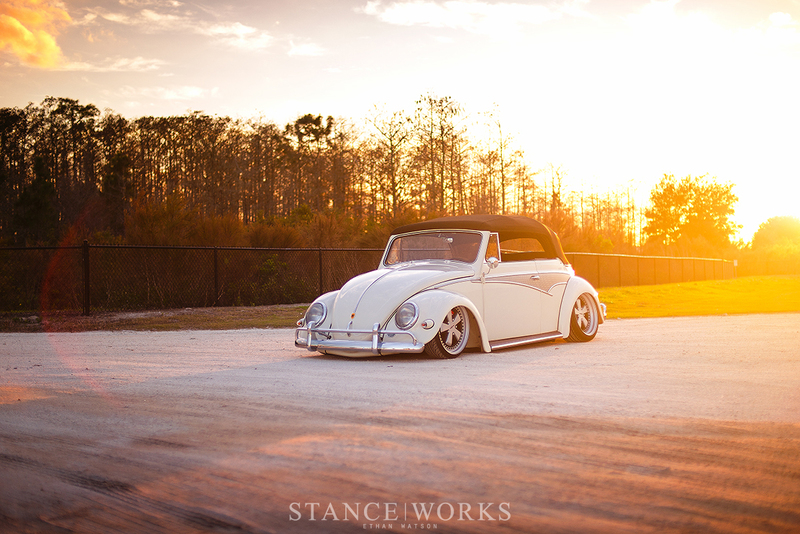 In terms of suspension, this bug’s front bag setup is a bit more unique than what most of us are perhaps used to. Using a 6” Jer*Fab narrowed link pin beam with a single bag on the passenger side of the car, it distributes weight evenly through rods that tie the left and right side together and allow both sides to operate off of one bag. The rear suspension is a more-typical dual air bag setup. 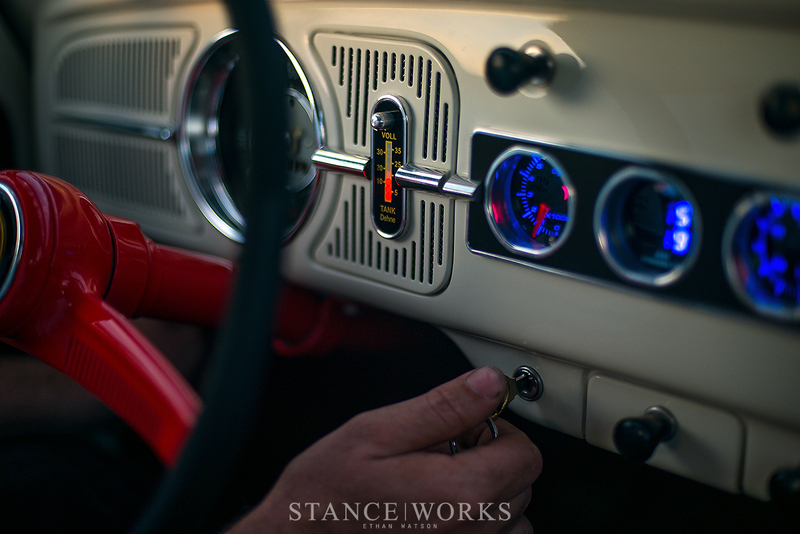 To keep it discrete, most of the management is hidden away, minus a digital pressure gauge that’s mounted in a radio delete triple gauge pod that also houses the tach and oil pressure. 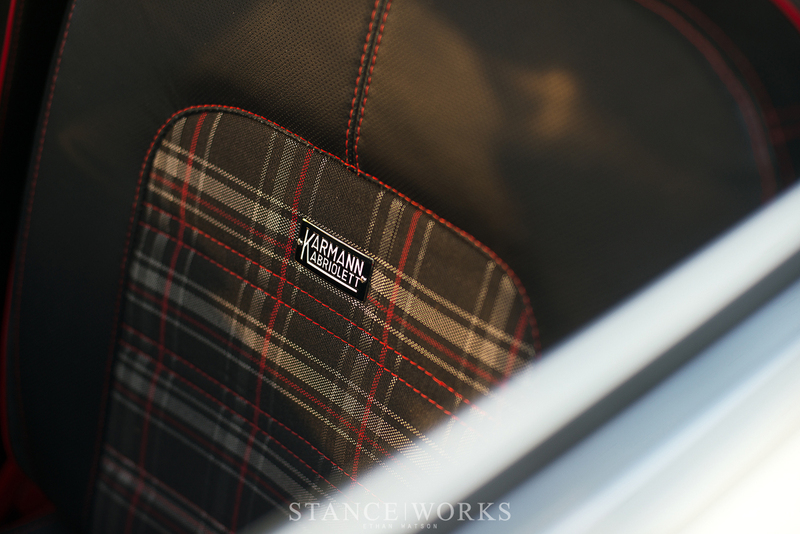 The interior retains the stock seats, recovered in black leather, black micro perforated leather, black alcantara suede and MK6 GTI plaid fabric. The touch of red details from the stitching and piping bring the combination together in fantastic fashion. 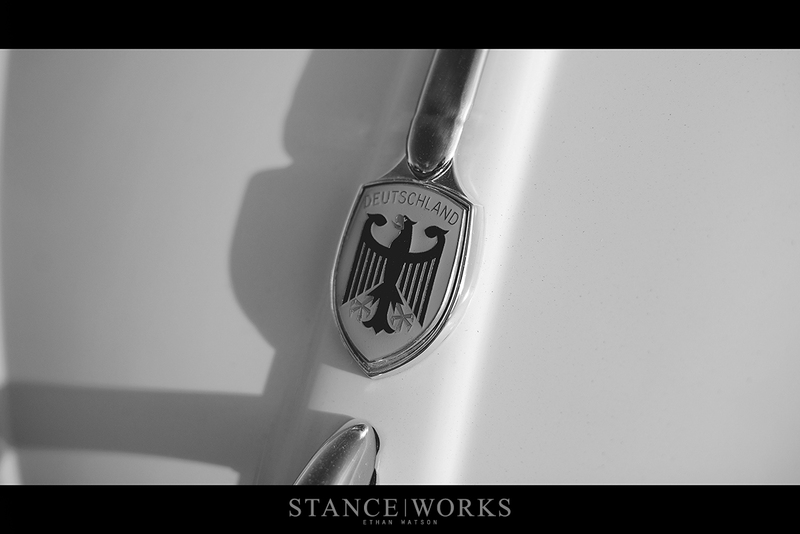 Karmann Kabriolett enameled badges were added to the front seat back rests. 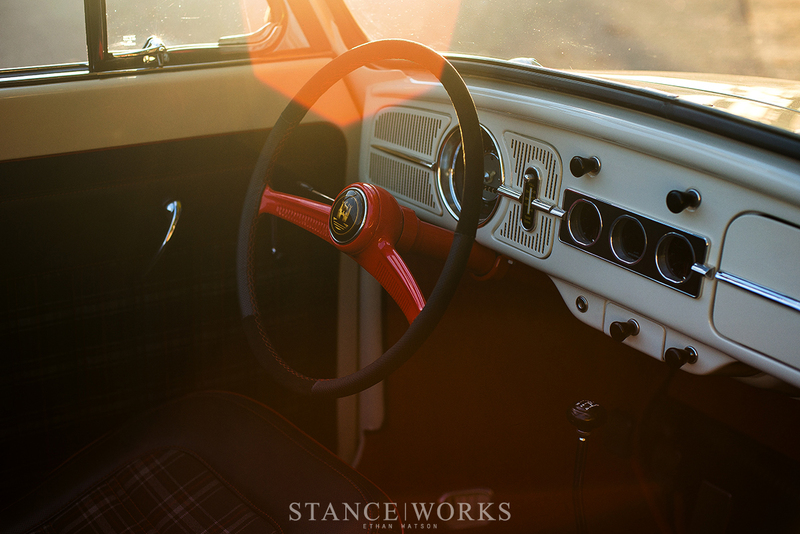 The steering wheel was painted Porsche guards red and a hand stitched cover of Alcantara suede and microperf leather. 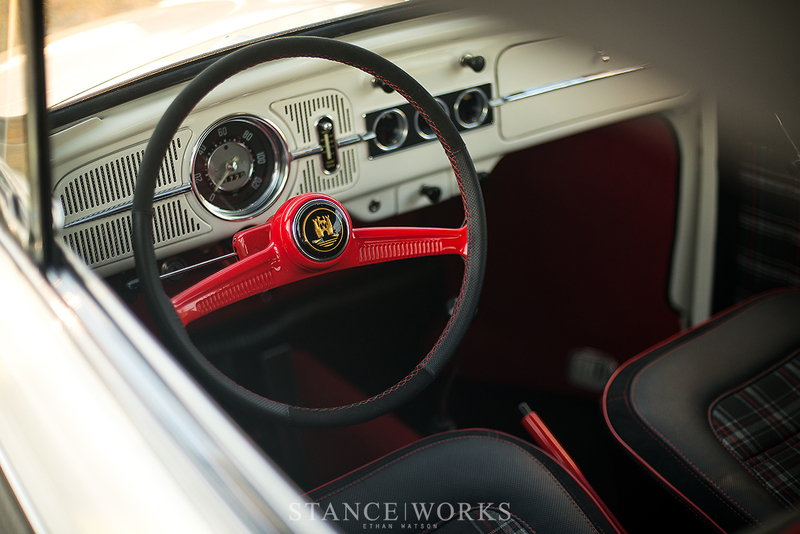 OEM black rubber floor mats were retained to keep some of the vintage VW element in the mix as well. 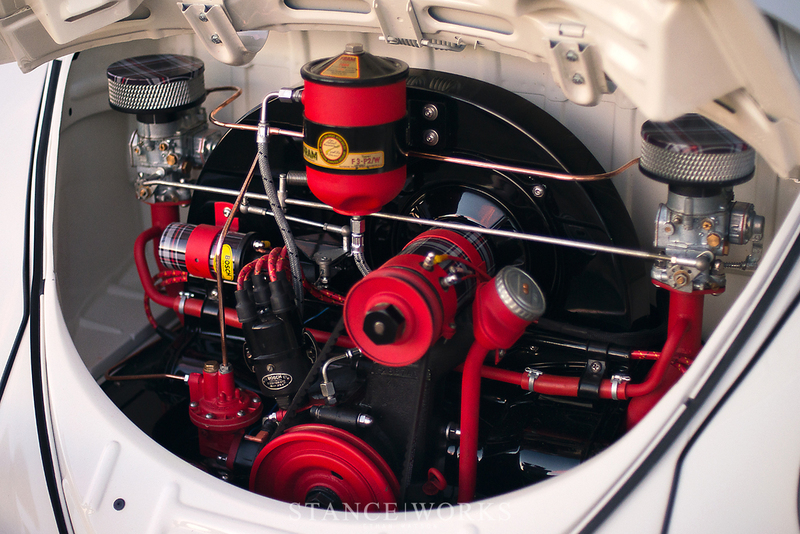 Powering this creation is an air-cooled 36hp 1200cc engine. The motor, though correct for the year, has been fully rebuilt with some 50’s era speed upgrades. 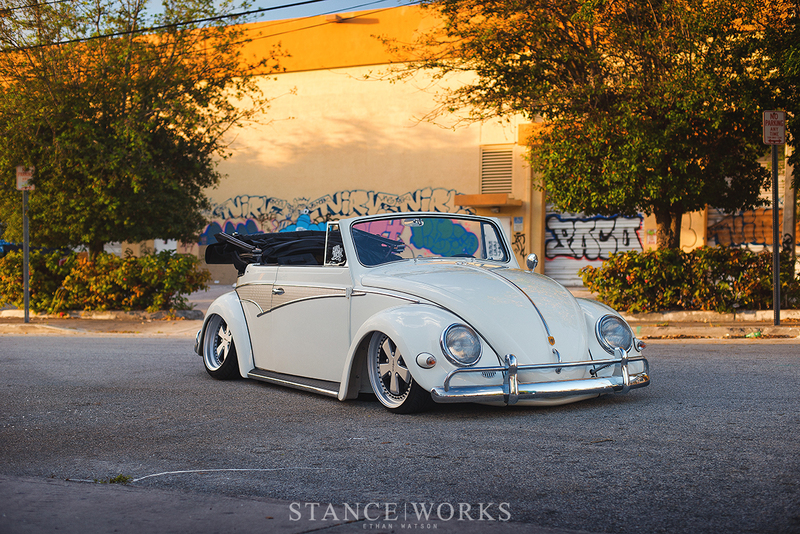 To quick list just some details of what Mike’s bug has: a Wolfsburg West okrasa dual port heads/dual carb setup, Aircooled Research stage 2 camshaft, lightened Porsche 912 flywheel, and a Vintage Speed stainless exhaust system. All this keeps the engine looking period correct while bumping the horsepower up to a whopping 50 ponies. 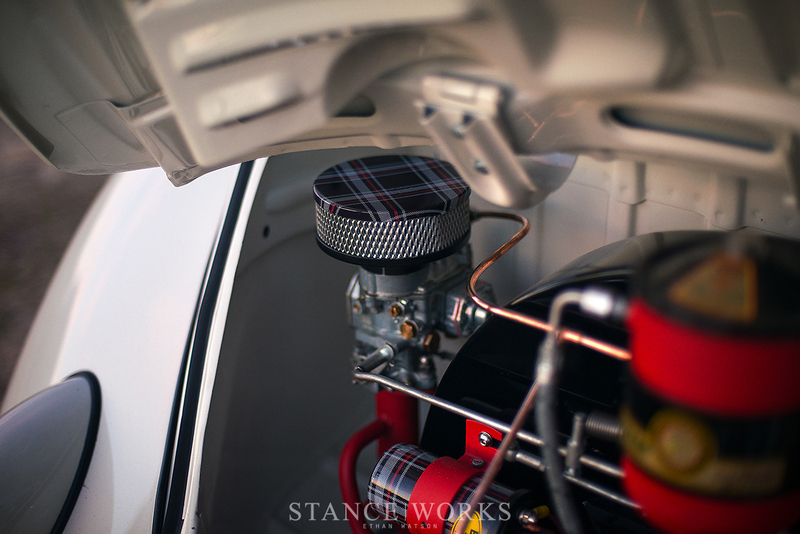 The miscellaneous accenting red powder coating and items wrapped in MK6 GTI plaid vinyl may add to that. To top it all off, the transmission has been changed out from the original to allow a fully synchronized unit. 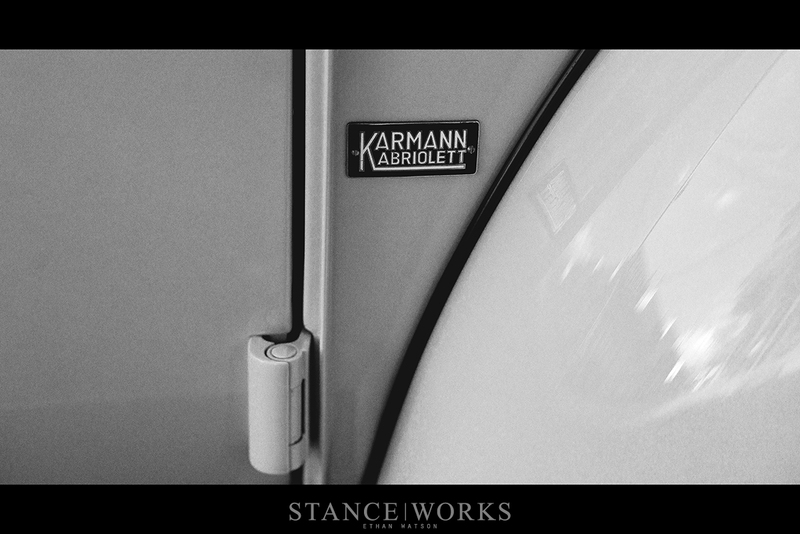 A unique aspect of the build is just how many little aesthetic factors connect this Karmann Kabriolett holistically. 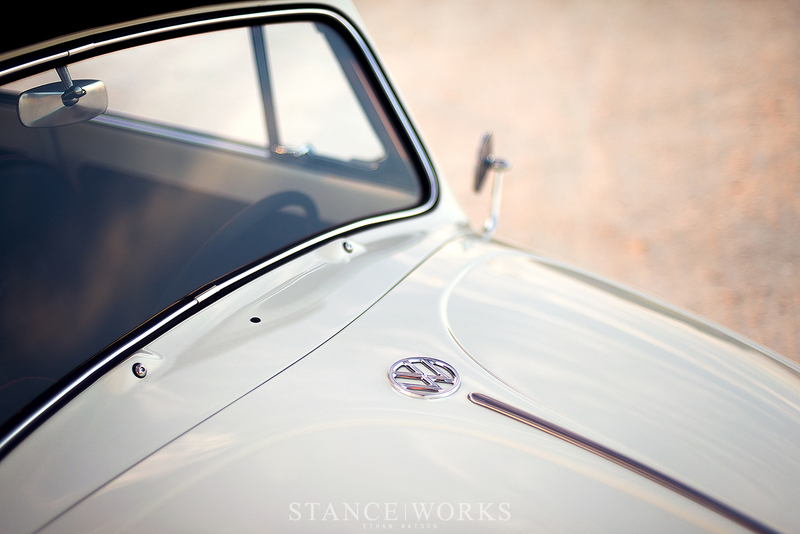 Mike has focused on carrying design cues from one location to another throughout the Karmann Kabriolett, creating a constant flow of gorgeous details. 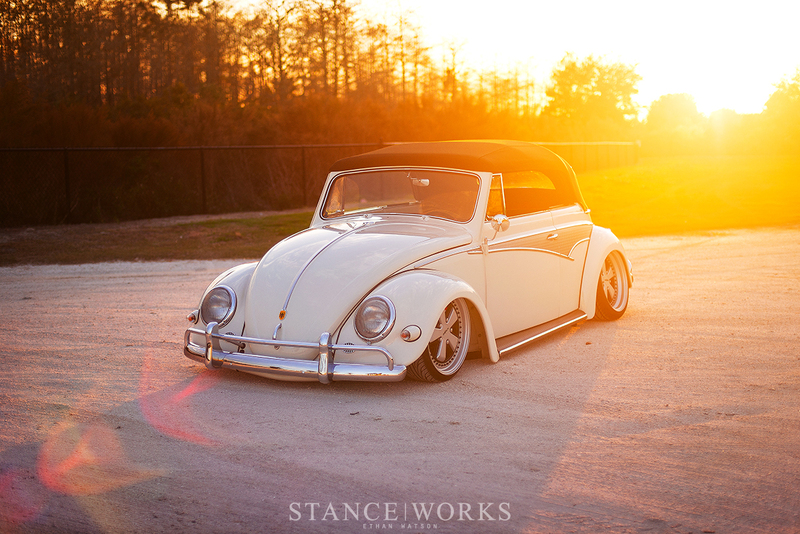 After having the chance to talk with Mike about this build, it’s no wonder this Volkswagen is such an icon. 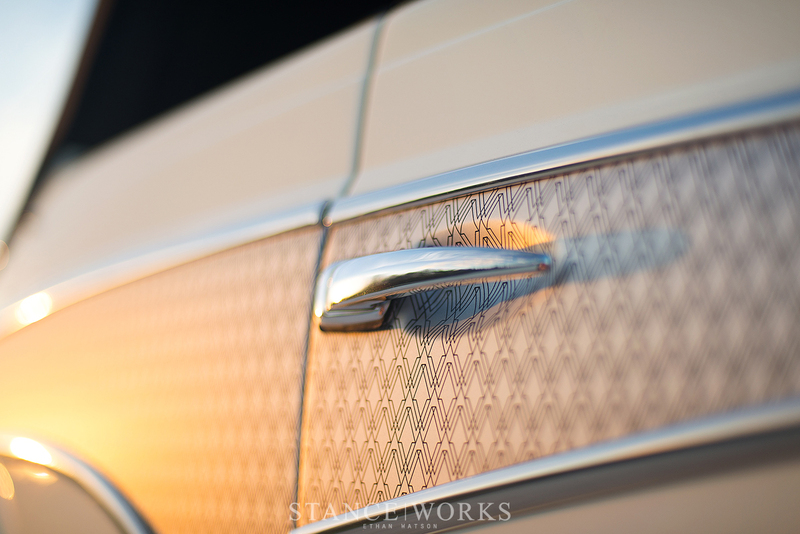 The amount of passion and accessibility to make these distinctive truly makes them quite special. 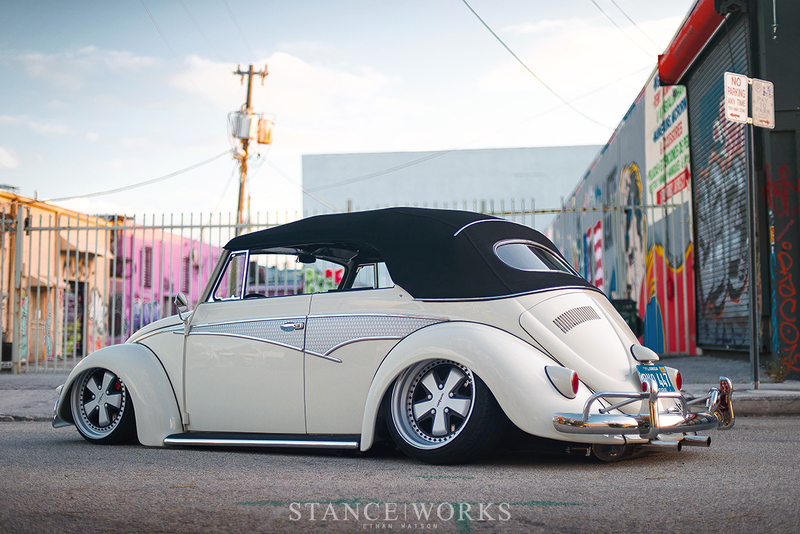 Immaculate work with just the right modifications. This is the perfect carbio-bug. Just when you think all the good design ideas are used up along comes a car like this! This is freakin’ amazing! Love the modern/old school wheels, the plaid accents, but especially the side panel treatment. Well done Mike, well done. Wow wow wow, this is great. Nice to see something with so much character.